if interested, there is some online calculators for things like cathode bypass and decoupling caps.. and a very interesting blog type thing here..
That a fantastic resource! Thanks a lot for sharing. A lot of bite size amp portions, in easy to digest format. That's got me some reading sorted!!!! I use a Horizon Precision drive on my Brent Hinds, it works well,adds gain, and is very versatile. Give it a try if you can. And I'll give you that too.... you can't hear the tone sculpting.... Because it's always there.... and it's been voiced in a way that really suits all guitars. It works for single coils, humbuckers - low or high outputs. It's a very good design for what it is - a single gain stage without tone control amplifier. I have a R30 head myself, and am well aware of the qualities and limitations of this amp. I'm also looking into modding mine to add an FX loop to it, and have looked at its schematics in quite some details, which is why I'm saying the the natural channel is voiced, with the usual array of resistors/capacitors filters, but with fixed, non adjustable values. 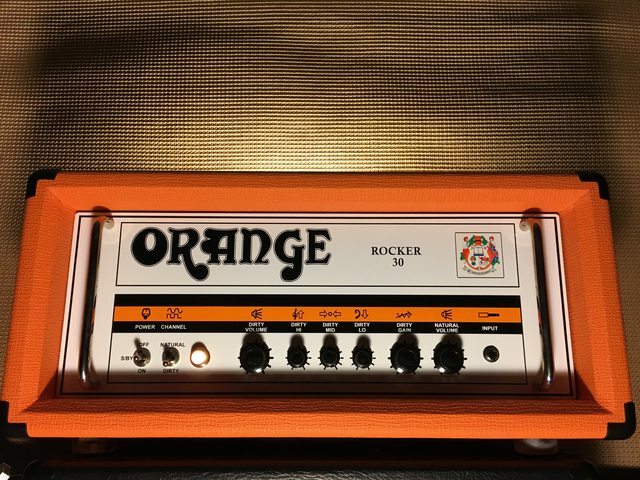 I like the Orange Rocker 15 very much and maybe I'll buy one. Do you have the schematics of that amp, too? I would love to see them and mod this amp to my tastes. I'm fully aware, that they belong to Orange Amplification and you don't need to post them here, maybe send me a PM. I won't spread them over the internet, they would be just for my personal purposes. Would be really nice, if you could help! I'm pretty sure, that someone would have them, at least the techs who need to repair faulty units. But I understand, that they aren't available for everyone. It's a shame. I used to only buy amps the last years, if I have the schematics of them. It's simply so much more comfortable for me then changing things for my needs. Orange is pretty secretive about their schematics. They only give them to authorised Orange repair centres. The R30 schematics are pretty widely available though, a member of this forum, Jondog, drew them a while back. The best way at the moment to get an idea of whats going on in the Rocker 15 is to look at schematics of the R30 preamp and the OR15/Dark Terror/#4 Root Terror effects loop/power amp/power supply. Won’t give you component locating identifiers, but will be similar layout and values and if your familiar with amp design and layout you can probably work out whats where. Look, I could buy a Rocker 15, look at the guts, the traces, the components and figure it out by myself. But I will not do so. It's no rocket science and if Orange fears some chinese guys from Bugera or other companies to rip off their design, they can't avoid that, because there are knowledgeable engineers who easily can draw the schematics, too. So what is the point to hide these and don't give them even to customers who are really interested in that? I love guitar amps and to see, how they work, which components and schematics lead to which sounds, I love modding them and that's a fantastic culture with a long history, maybe today they are called "guitar nerds" rather then "techs". It's a shame, that even you guys, who may be in contact with Orange on a regular basis can't get the schematics. Just for comparison - I've asked EVH and Jet City Amplification in the past and they gave me every single one I wanted. I appreciate that very much and to me I call that a great customer support. I agree, reverse engineering is far easier than actually coming up with something original on your own. Whatever the case, even if they are as crafty to open one up dissect and learn from it, its arguably doubtful they will ever produce something of quality that can compete with Orange, so it that respect Orange should fear nothing. Regardless, everyone that wants to mod and see what more they can get from an Orange amp, I just hope they are careful that's all. As for myself, I am extremely happy with my Orange amps just as they are. If I feel I need that something more, I will at most swap out tubes to try others, a harmless little mod, or an external source, like an FX pedal or rack unit. I would try every new amp with my personal standard tubes, which I have for testing purposes. But there's nothing wrong with JJs, which are in modern Orange amps, if they are selected ones. And please don't forget the cabs and different speakers! This could alter the overall sound so much. Many people underestimate that, play their same cab over years and wonder, why they are never happy with any new amp. Cabs and speakers are as important as the amp itself. I'm with you on that for sure, I am very well aware of how an amp's tone can be altered just from using different model speakers and cabs. I use only 2 with my Terrors, Celestion Vintage 30 and Heritage speakers. I don't mix them up its either the Marhsall & Blackstar cabs with V30 or the two EVH5150III 112s with their Heritage. But I might try mixing that up one day just to hear how my tone changes. I liked that EVH branded 50W Celestion very much, which they only use in their 1x12 combos. I had several requests to EVH, Celestion and some dealers, but there is simply no chance to get that speakers separateley. I wish they were regularly available. In this 1x12 Blackstar cab I liked a WGS Invader very much. If you want to try something different at some point. However it doesn't hurt to mix speakers and try several combinations. I don't dis-agree, but for now thats what it is. However, if you get the schematics please feel free to contact me! Most fender amps are sold with their schematics. I agree that Orange should be more helpful with their customers. Should they help people who just want to build one..... that's one other point, hard to dissociate from the 1st one.